A pair of socks is a pair of socks is a pair of socks. Right? Not anymore. Even a pair of socks have technology that can improve athletic performance now. 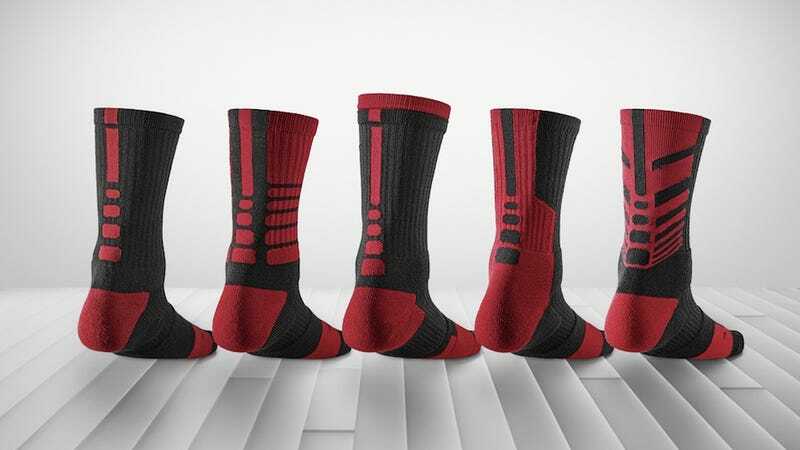 If you're not familiar with Nike Elite Basketball socks, the socks specify which foot each sock is for. It's like a basketball shoe now, the socks have strategically cushioned zones for the left and right foot to provide support and comfort. It's a little sick and twisted to think that your right sock doesn't work with your left foot, huh? I know. But you can tell the difference. You can see the extra padding in the sock's design. There is cushioning where basketball players cut and slide their foot, extra padding around the ankle and Achilles so shoes don't beat 'em up and the ribbing across the mid-foot gives for a larger range of motion. In other words, it looks like a sock—specialized.